﻿ Paul Scholes: "Cristiano Ronaldo price has increased since 2009"
11.11.2011 » Paul Scholes: "Cristiano Ronaldo price has increased since 2009"
Cristiano Ronaldo transferred to Real Madrid in the Summer of 2009 for a World record breaking fee of 96 million euros (80 million pounds). One of Manchester United legends, Paul Scholes, visited Portugal this week and stated that Cristiano Ronaldo's market value is now bigger than before. Manchester United legend, Paul Scholes, retired from football last summer, after serving the Red Devils for his entire professional career (1994-2011). The English player visited Portugal this week and had a few remarks on Cristiano Ronaldo's current market value. Scholes believes that Ronaldo's market price is now higher than it was in 2009, when the Portuguese player got transferred from Manchester United to Real Madrid, for a world-record breaking fee of 96 million euros (80 million pounds). 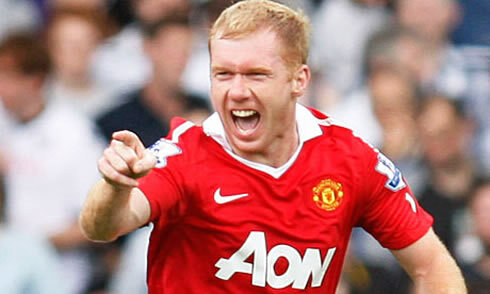 Paul Scholes is now 36 years old and he's definately the kind of player that fans love to have on their club. The English player had 446 appearences for Manchester United, from which he scored a total of 102 goals, from 1994 till 2011. Scholes is now a coaching staff member at Manchester United and his loyalty to the club is something very rare in football's modern era. Also known as the "Ginger Ninja", or simply "Scholesly", Paul Scholes honorable career at United will always be remembered by many football fans from all around the World. While visiting Carlos Queiroz football academy "Football by", located in Carnaxide, Portugal, Paul Scholes left a few notes regarding his former teammates at Manchester United, Cristiano Ronaldo and Luis Nani. Regarding the last one, the "Ginger Ninja" agrees that he has been turning into a key player on this Sir Alex Ferguson team, specially over the last couple of years. The Portuguese duo was highly praised by Scholes. Scholes: "Cristiano Ronaldo got transferred to Real Madrid but he didn't stop scoring goals. He has been brilliant at Manchester United and he's doing the same at Real Madrid. Cristiano Ronaldo has reached a different level from the rest", noted the English player. Paul Scholes also mentioned Luis Nani, who he considers to have matured a lot as a player over the last few seasons, mostly due to Sir Alex Ferguson's influence. As many people already know, Scholes is not a man of many words, so before finishing his short statements to the press, he still shared his view on Cristiano Ronaldo's market value, just in case any club is still thinking about taking the Portuguese from the Santiago Bernabéu. Scholes: "Cristiano Ronaldo keeps performing at a top level and that has allowed him to raise his own price. It's possible that he's now worth more than before, from when he was still playing at Manchester United." Real Madrid next match is against Valencia, for La Liga, in the 19th of November, 2011. Over the last days, Cristiano Ronaldo is now with the Portuguese National Team, preparing the 2-games playoff stage, against Bosnia Herzegovina. You can watch Juventus live stream, the first leg of Bosnia vs Portugal, this Friday, the 11th of November. The 2nd leg will be played in Lisbon, Portugal, in the 15th November of 2011. The winner will qualify for the EURO 2012.